For the rest of this post, about 8 pictures total, please click to continue if you’re on the front page. Up on top of the pavilion I met Tim and his two dogs. I haven’t seen Tim for a few months. I always enjoy talking with him because he has an interesting perspective on the world. 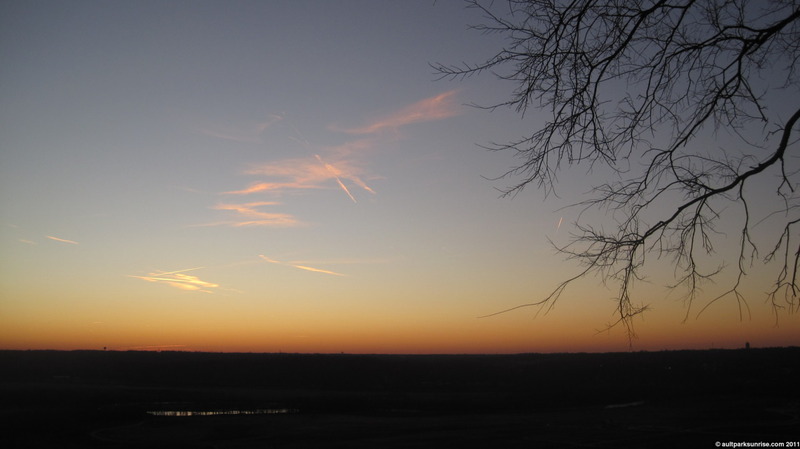 We talked about crop circles and the Kennedys; great conversation while watching the sun come up over the Little Miami River Valley. Behind me, the lawn was still deep in shadow and the western sky was slowly shedding off the deep blues and purple highlights. I realized that one of these days I should try to bike over to that tall building on the left side of the horizon. I’m not sure where that is, exactly, but it would be another great Cincinnati hill-to-valley-to-hill trip. I have never biked to the West Side and I’m sure it would be a beautiful ride. I’d like to imagine that about 30 years ago the view from the pavilion would have been pristine without the tops of the oak trees dotting the horizon. That’s OK though, by make the winter sunrise that much more unique because the summer foliage blocks the view. A vertical sunrise shot of Sunrise 134. 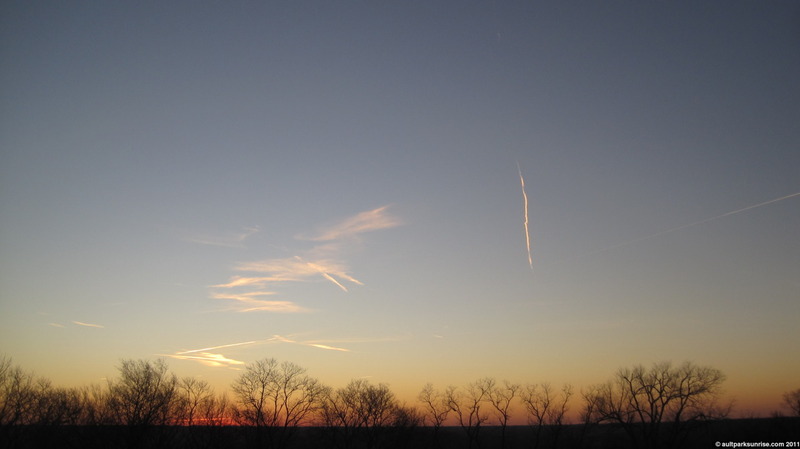 I find it interesting how similar all of those trees’ branching structures are to the middle right of the horizon. After wrapping it up with Tim I headed off to work. As expected, the first half was amazing (downhill) and the second half was nauseating and swampy. I had my hooded sweatshirt, winter reflective jacket, facemask, double woolen gloves, two pairs of socks, and insulated running pants on. I was a wet sopping mess by the time I rolled up to work. That’s the interesting thing about commuting by bike – if you do it several days in a row to get back into the rhythm, it becomes easier to maintain a cadence where your heart rate doesn’t rise high enough to cause you to sweat. I was a bit out of shape and also dressed way too warm, two things that can shatter plans of a dry arrival. Luckily I as prepared with a change of clothes and deodorant, although executing a perfect bike commute is still something that I’m trying to figure out. It’s well worth it but does require extra planning. 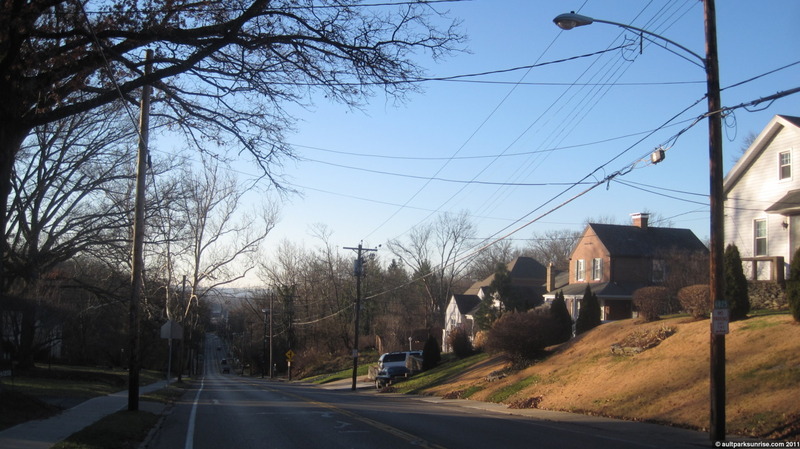 This is the top of Stewart Rd, the final climb of the hill. This only represents about 3/5 of the total ascent from the deepest point in the valley, but it’s definitely the steepest. I love my 1977 Fuji S-10S, she’s been a trusty steed, but climbs like this do make me wish I had 3 more gears on the lower end. Perhaps 2012 holds a drive chain upgrade for old Fuj, something that would certainly make me more mobile and more inclined to commute via bike more often. I’ve said it before and I’ll say it again… The topography in Cincinnati provides some of the best biking around. Also… some notes for those who read until the end of this post! 1. 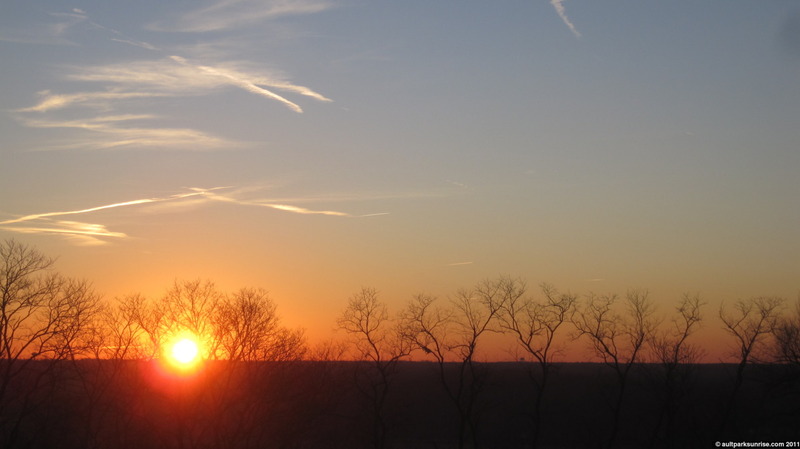 I heard about a place in Mariemont that has an overlook. I read about it in this great book that I picked up that was recommended by Dawn, a lady that I met at the park last month. It’s called “Cincinnati Observed” and there is a picture of an overlook in Mariemont that looks out over the Little Miami River Valley. I can’t find it by googling and I don’t remember the name of it, so I’ll have to check the book tonight when I get home. 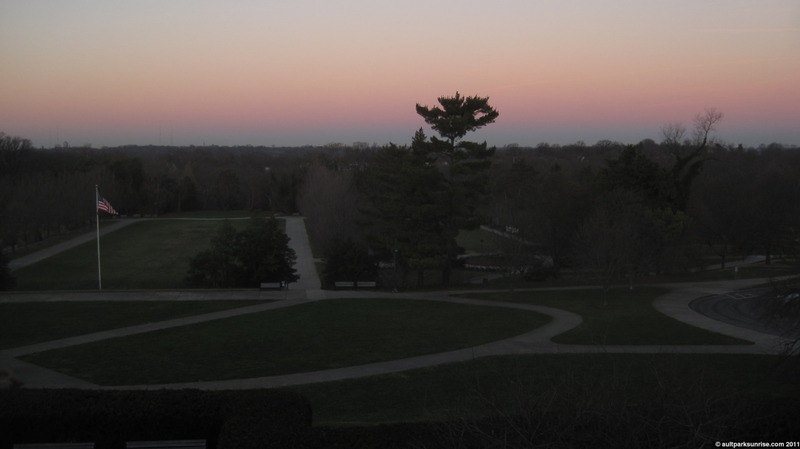 Mariemont is not too far from Ault Park so I think it would make for a great sunrise location. The book, so far, is an interesting read that covers the history and exploration of Cincinnati from an architecture heavy viewpoint, mostly neighborhood by neighborhood and block by block (downtown). I’ll cover more about it in a future post. The second thing is that I have found evidence of the Mt. Adams ruins by sleuthing around on Google Maps’ Satellite View. It’s amazing actually because they’re hiding in plain site. There are a few flickr pictures of the ruins, but I haven’t seen a complete documentation on the social web. I plan on exploring the ruins in the near future while the trees are still bare. I actually used the location of the Rookwood Pottery building from an early 1900s picture to locate the incline on the map. Stay tuned, it’ll make for a great morning exploration. 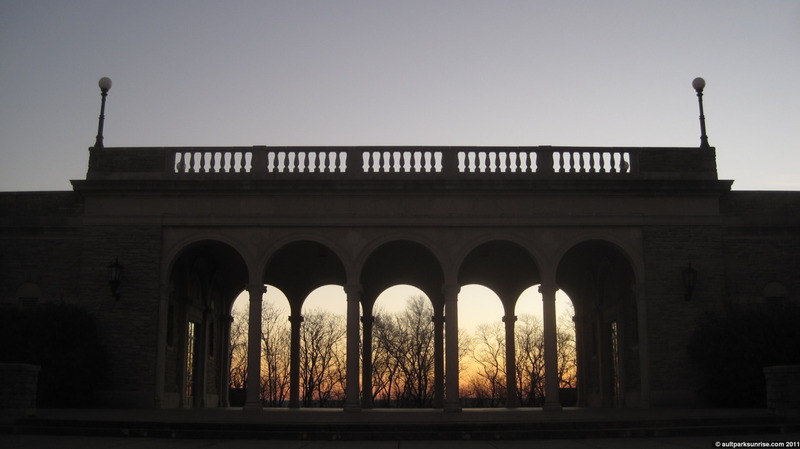 This entry was posted on January 6, 2012 by Ault Park Sunrise. 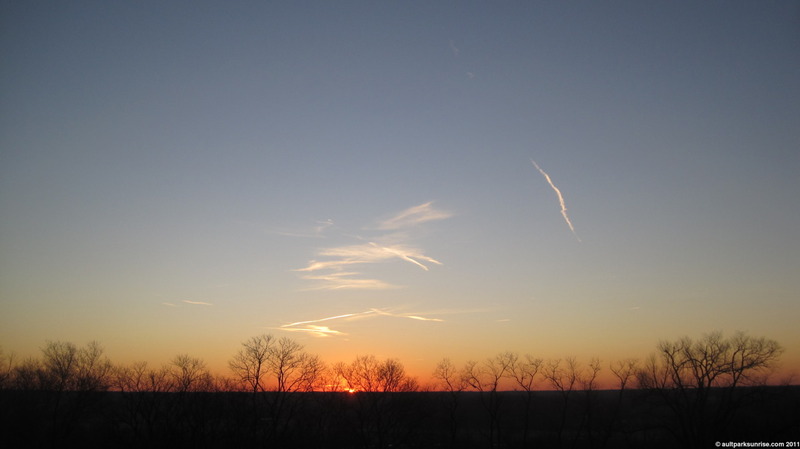 It was filed under ault park, cincinnati, clear skies, sunrise and was tagged with ault park, cincinnati, clear skies, pavilion, silverton, sunrise. 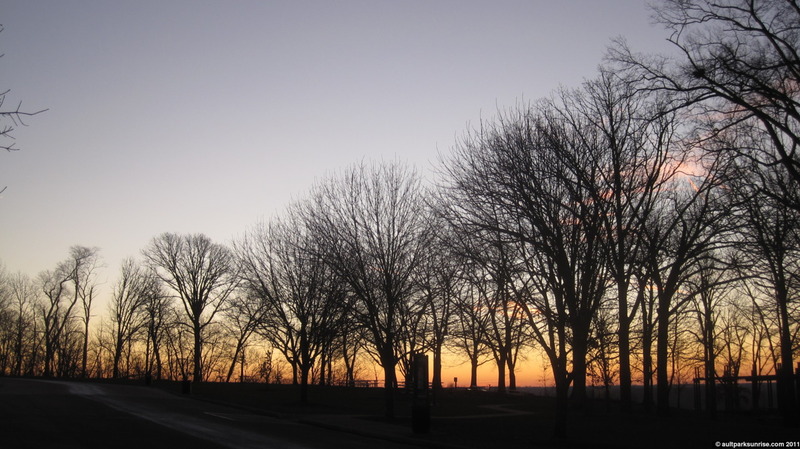 Beautiful images, I love seeing the bare tree branches on the skyline. Good luck with the pavilion line up – that would be awesome! Thanks! 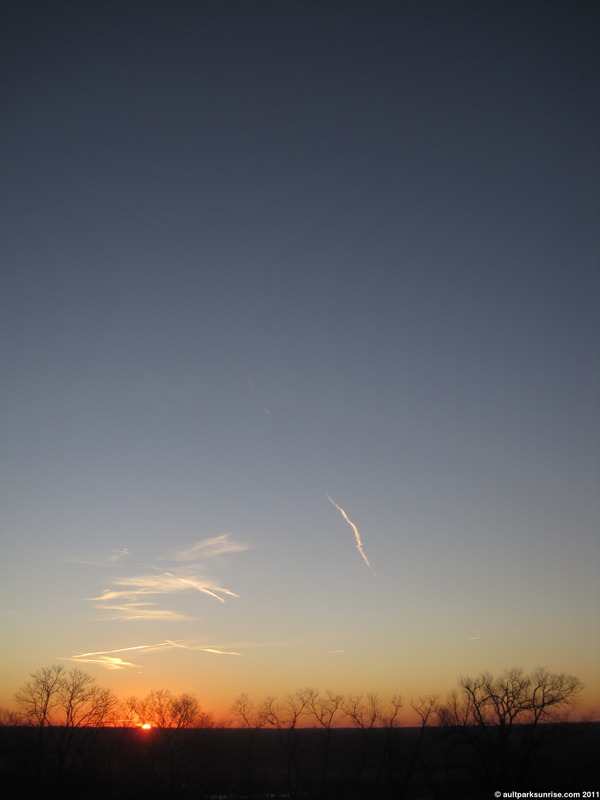 Soon enough I’m going to head down to the golf course and find some awesome silhouette shots. I realized that a golf course is the perfect spot because all of the trees are kept well groomed and by themselves!